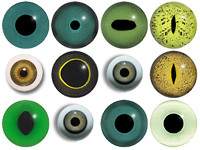 Special Offer - A new shape crystal fish eye with an aspheric profile and a defined iris shape set into the eye. Fired black enamel pupil designed for self painting. Fish Glass Eyes. A high quality crystal fish eye in a flat profile with a totally clear pupil. Designed for self painting. Rainbow Trout Fish Eyes. Great eyes for most species of fresh and saltwater fish. Made from German crystal and hand painted in enamel. Mammal Glass Eyes. 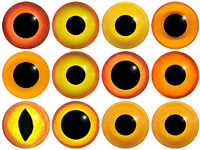 A high quality crystal concave/convex eye with a round transparent pupil for self painting. Mammal Glass Eyes. A high quality crystal concave/convex eye with a transparent oval pupil. 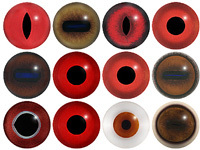 Special Offer - A high quality aspheric crystal fish eye with a totally clear pupil. Designed for self painting. Reptile and Mammal Slit Pupil Glass Eyes. A high quality crystal concave/convex eye with a transparent slit pupil. Special Offer - A high quality crystal fish eye slightly oval in shape with a directional look and a clear crystal pupil. Designed for self painting. Special Offer - A high quality crystal fish eye slightly oval in shape with a directional look and a fired black enamel pupil. Designed for self painting. Special Offer - A high quality aspheric crystal fish eye with a fired black enamel pupil. Designed for self painting.